What does market volatility mean for fixed income? We have noted for a while that investors may have been underpricing inflation and that signs of potential price pressures could disrupt markets. Inflation is a risk we are monitoring closely. This is because concerns over inflation could incentivize the U.S. Federal Reserve (Fed) to hike interest rates faster and higher than previously expected. Tighter monetary policy could tighten overall financial conditions, which could be negative for financial markets.2 There has been little realized inflation, but recent volatility suggests that bond investors are beginning to worry that inflation will rise sharply on the back of strong growth boosted by tax cuts in a late-cycle economy.3 We believe that few investors have anticipated a sharp rise in inflation, so this would be a surprise to the market. We are focused on analyzing the impacts of tax reform on inflation – especially on wage pressures. While inflation itself is typically not bad for credit spreads, potential Fed rate hikes to combat this could be negative. We believe markets need to reassess inflation expectations and monetary policy before we see stability. In general, volatility has been muted in emerging markets relative to what we would expect based on history, given the significant sell-off in developed market equities. We believe this is due to still-easy overall financial conditions, even if they are tightening somewhat. 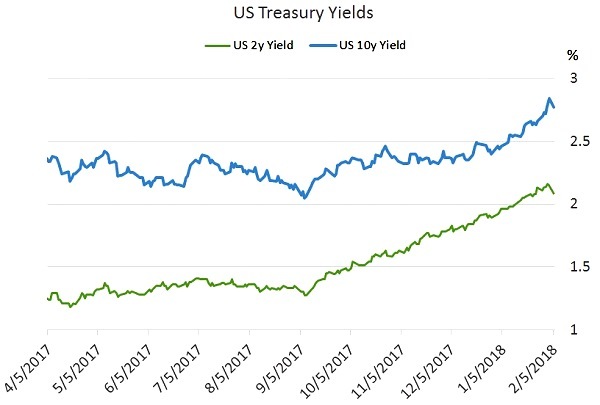 In the past, the U.S. dollar has often appreciated when U.S. Treasury yields were rising, but this has not been the case recently – and as a result, financial conditions have remained easy. While it is possible the market could overshoot, we do not think the European bond sell-off will gather pace unless we begin to see signs that inflation is gathering pace. Our analysis indicates that global inflation pressures could remain subdued for the next six months or so, enabling the ECB to remain accommodative. A slow and gradual approach, coupled with a continued buoyant global economic environment, should be good for risk assets, in our view. The risk, however, is that, with labour markets tight in some regions, such as Germany, we may begin to see material wage increases and subsequently higher inflation. The probability of this scenario has increased in recent months. What will drive markets after Trump’s victory? 1 Source: Bloomberg L.P. From Jan. 31, 2018, to Feb. 6, 2018, the S&P 500 Index fell 4.6%, the Bloomberg Barclays U.S. Aggregate Credit Index total return was -1.5%, and the Bloomberg Barclays U.S. Corporate High Yield Total Return Index returned -0.95% over the period. 5 Source: Bloomberg L.P. Credit spreads are the difference in yield between two bonds of similar maturity but different credit quality. Typical spreads compare corporate bond yields to U.S. Treasury yields. A wide spread refers to a large difference in yield, while a tight spread refers to a small difference in yield. The spread on the Bloomberg Barclays U.S. Aggregate Credit Index was 84 basis points on Feb. 6, 2018, compared to 89 basis points on Dec. 29, 2017. 6 Source: Bloomberg L.P. The spread on the Bloomberg Barclays U.S. Aggregate Credit Index was 84 basis points on Feb. 6, 2018, compared to 81 basis points on Feb. 1, 2018. 8 Source: Bloomberg L.P. High yield defined by the Bloomberg Barclays U.S. Corporate High Yield Total Return Index. From Jan. 31, 2018, to Feb. 6, 2018, the Bloomberg Barclays U.S. Corporate High Yield Total Return Index returned -0.95% compared to the S&P 500 index, which returned -4.6% over the same period. 9 Source: Merrill Lynch. The spread on the BofA Merrill Lynch U.S. High Yield Master II Index was 345 basis points on Feb. 6, well below the 20-year average of 608 basis points. The Bloomberg Barclays U.S. Corporate High Yield Total Return Index covers the universe of fixed rate, non-investment grade debt. The index includes both corporate and noncorporate sectors. The Bloomberg Barclays U.S. Aggregate Credit Index represents the performance of the U.S. investment grade bond market. The BofA Merrill Lynch U.S. High Yield Master II Index tracks the performance of below investment grade, U.S. dollar-denominated corporate bonds publicly issued in the U.S. domestic market.